Click here to watch the segment, which aired on August 23, 2017. Correspondent Christal Young visited Berkeley College in Brooklyn, NY, to meet the incubator’s group of designers-in-residence working to develop their businesses and brands. While filming “Where’d You Get That?” Ms. Young received a glimpse at the heirloom clothing and accessories for children crocheted by Norine Medas and her company, Mon Petit Coeur. She then spoke with Angelique Terrelonge about her company, South Beach Furs, a high-end collection of apparel and accessories that uses eco-friendly feathers and materials. “Where’d You Get That?” also introduced viewers to Batista Collections, colorful knitwear made by Milagros Batista with natural fibers heavily inspired by her home country of the Dominican Republic. The segment also offered a first look at a new collection from Berkeley College alumna Leidy Herrera, who designs women’s apparel that caters to millennial professionals looking to combine style, comfort and a sense of tradition to their wardrobes. Photo Captions A and B: FOX 5 correspondent Christal Young interviews the designers-in-residence from theBROOKLYNfashionincubator (BFI) at Berkeley College for “Where’d You Get That?” a weekly fashion segment on the FOX 5 morning program ‘Good Day New York.’ Pictured at the top with Ms. Young is Leidy Herrera, founder of Leidy Herrera, LLC, Berkeley College alumna, Class of 2009 (left), and Angelique Terrelonge, founder of South Beach Furs (right). Pictured above with Ms. Young is Norine Medas, founder of Mon Petit Coeur (left), and Milagros Batista, founder of Batista Collections (right). 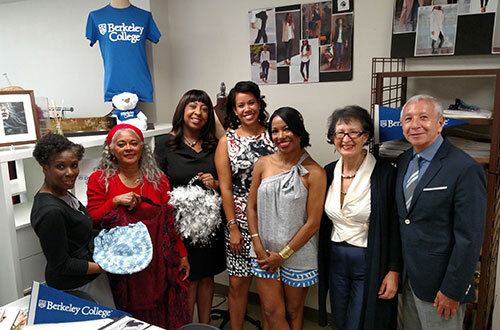 The BFI at Berkeley College is one of five fashion incubators spearheaded by Macy’s in talent-rich areas across the United States. Over the course of 12 months, the incubator provides five fashion entrepreneurs access to work space, supplies and advice from leading experts in all facets of the fashion business, including sourcing, production, marketing and e-commerce. As the host institution in Brooklyn, Berkeley College provides the design space and work areas for the incubator at its campus on Duffield Street in the downtown area. The incubator also utilizes Fashion Merchandising and Management students from Berkeley College as interns looking to learn the industry. “To really encourage participation within the community, what better way than to train, educate and provide support to the future designers of Brooklyn?” said Dario A. Cortes, PhD, Senior Vice President, Strategic Alliances, Berkeley College. Meet the Designers: Click here to learn more about the designers-in-residence from the BFI at Berkeley College. This year, the BFI at Berkeley College introduced the “Remote Membership” program designed to provide support and mentorship to fashion entrepreneurs throughout the U.S. who cannot physically be at the incubator on an ongoing basis. Other sponsors of the incubator include United Parcel Service, PGM Dress Form, Hedaya Capital Group, M&T Bank, Fashion Week Brooklyn, and Trader Joe’s. Click here to learn more about the BFI at Berkeley College. Photo Caption C: Maria Barraza, Director of the BFI at Berkeley College (second from right), Dario A. Cortes, PhD, Senior Vice President, Strategic Alliances, Berkeley College (far right), and designers-in-residence from theBROOKLYNfashionincubator (BFI) at Berkeley College meet correspondent Christal Young (third from right) for an appearance on “Where’d You Get That?” a weekly fashion segment on the FOX 5 morning program ‘Good Day New York.’ The designers-in-residence pictured from left to right, above, are Norine Medas, founder of Mon Petit Coeur; Milagros Batista, founder of Batista Collections; Angelique Terrelonge, founder of South Beach Furs; and Leidy Herrera, founder of Leidy Herrera, LLC, Berkeley College alumna, Class of 2009.